Current/Elliot’s Infantry jacket has been on my wish list for about a year, but I could never manage to pull the trigger on the original, army green version. I have a couple of other pieces in that color that I just don’t ever seem to wear, so I didn’t think I’d get that much use out of it. Last week, this bleached version popped up on Shopbop (along with one in navy) and I knew it was time to grab it and go. Luckily last week was also the Friends & Family sale, so I got it 25% off! 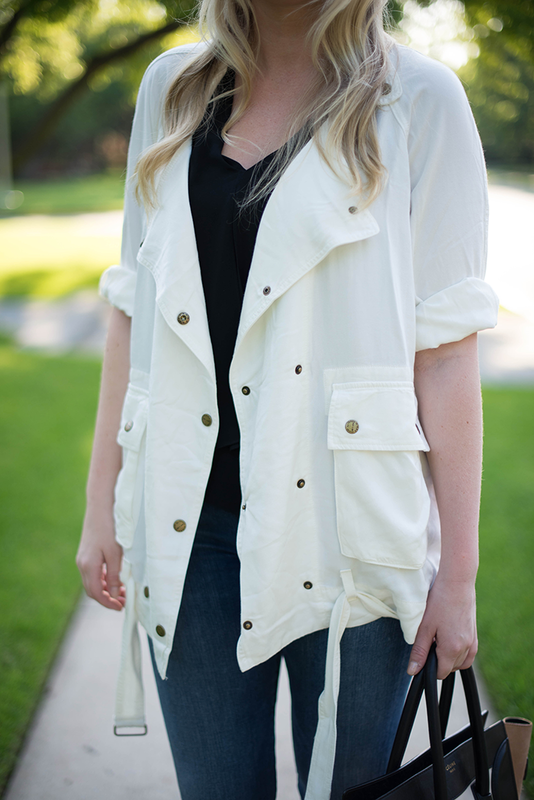 It’s an oversized, easy jacket that looks great over tanks, tees and dresses making it one of the most versatile pieces in my closet. A perfect travel companion, especially when you’re not sure what the weather will be like. I just love the relaxed fit and look of it – it’s a cooler and chicer alternative to a denim jacket, in my humble opinion. Speaking of Friends & Family sales, Theory has a good one going on right now and they’re giving you 25% off all styles until April 30th! Stock up on classic wardrobe staples and season-less basics like this chic little black dress or my personal favorite button-down. I’m extremely tempted by these black mules – the cut is slightly more elevated and sleek compared to other mules I’ve seen out there. They just seem like the perfect year-round shoe! Finally, these slouchy menswear-inspired shorts would look so effortless with a tank and blazer. Need! Enter code TSPRINGFF at checkout and save. Your shoes and jacket are killer, love this outfit. Those Alexander Wang heels are HOT! Those shoes are sick! Perfect weekend look! Needed this jacket for my Istanbul trip! And you’re right – I never pull out the army green items that I have. This is a great alternative. Love this relaxed look! Your Celine is gorg… I have a black mini luggage, but the tricolor is amazing. Will definitely be checking out Theory’s sale! Have a great weekend, doll! I can see why this jacket was on your wish list! It is great spring jacket. Those shoes are amazing!! Have a great weekend! 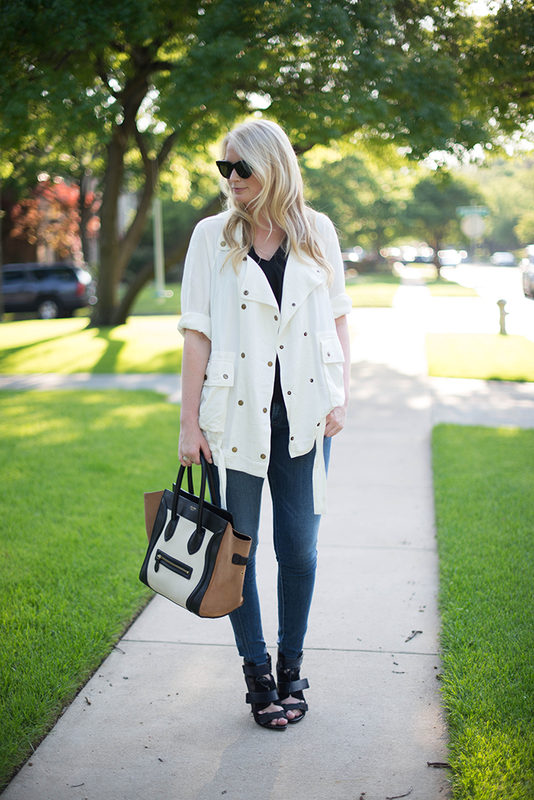 Love the simple neutral colors! THAT JACKET IS KILLER – LOVE THE COLOR! Can’t stop staring at that purse!!! Beautiful jacket! and that Celine is gorgeous! I love how you paired the utility look with those fun heels. That bag is divine! It adds some dimension to this neutral ensemble. That jacket is the perfect investment piece. It’s so versatile and effortless. Great find! 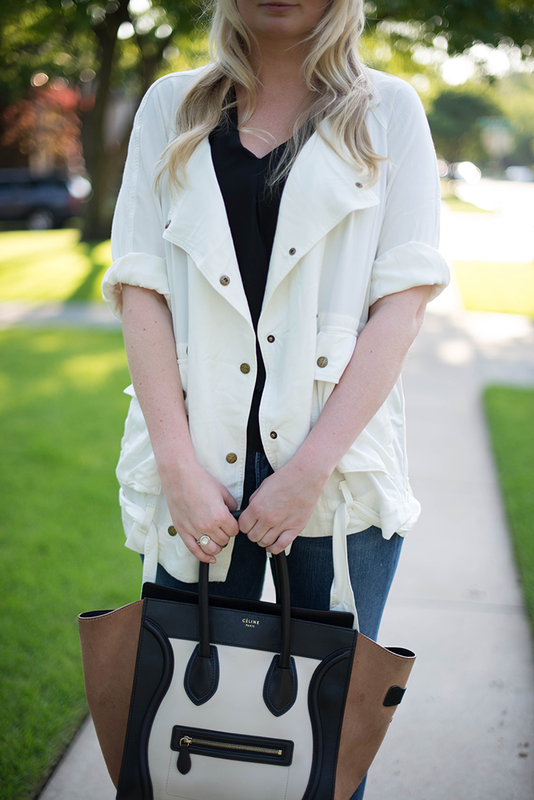 This is such a great jacket and looks so versatile! LOVE your shoes! This outfit looks great! love that jacket, looks so good a little dressed up! Love that jacket – it’s gorgeous! Those shoes are pretty amazing as well!